With over 30 years of experience in the automotive wheel industry, Forgestar Performance Wheels has bridged the gap between forged wheels and cast wheels. Forgestar is proud to introduce the world's first one piece lightweight rotary forged custom flow formed wheel lineup. Rotary Forged Flow Forming is a manufacturing procedure that rotates the wheel (or rim section) over a special mandrel and three hydraulic rollers under tremendous pressure. The rotation and pressure forces the rim area to form against the mandrel, creating the shape and width of the rim. During Flow Forming, the rim actually "flows" down to create the full rim width. During Flow Forming, pressure applied to the cast rim actually changes the metal's mechanical properties, so the rim's strength and impact values become similar to those of a forged rim. This translates to a 15% lower weight savings when compared to a standard cast wheel. Because Forgestar wheels are made to order to your specifications, our clients are able to choose a wheel that will perfectly fit their own individual vehicle and tastes. Forgestar wheels are Certified SAE, JWL and VIA. Lightweight design allows proper clearance for "Big Brake Kits"
If you require assistance with choosing the proper wheel specification to order for your application, please Contact Us. We will be happy to help you with our expertise. Forgestar custom powdercoats each wheel to the customer's requested finish. Powder coating is applied electrostatically, and baked with heat to create a hard finish that is tougher than conventional paints. * Additional charges will apply. Optional finishes may require longer delivery lead times. Please Contact Us prior to ordering. Forgestar Performance Wheels are backed by a lifetime structural warranty to the original retail purchaser. A limited one-year manufacturer's warranty guarantees wheels will be free from defects in materials and workmanship under normal and reasonable use. Terms: All warranty returns that are reviewed by Forgestar's warranty return department and found not to be subject to warranty coverage, will be returned to the sender, without repair or replacement, at the senders expense. his is a limited warranty. Therefore, no warranties or representations, expressed or implied, are being made. Forgestar neither assumes nor authorizes any dealer, representative or other person or entity to assume for it any obligation or liability in connection with Forgestar products uses or applications. Forgestar further reserves the right to make changes or improvements in design, materials or specifications or make product changes without incurring any obligation to replace, change or improve products manufactured prior to redesign. For all prices, products and offers, Forgestar reserves the right to make adjustments due to changing market conditions, product discontinuation, manufacturing price changes, errors in advertisements and other extenuating circumstances. Return Policy: Forgestar strives to be the leader in custom manufactured wheels. 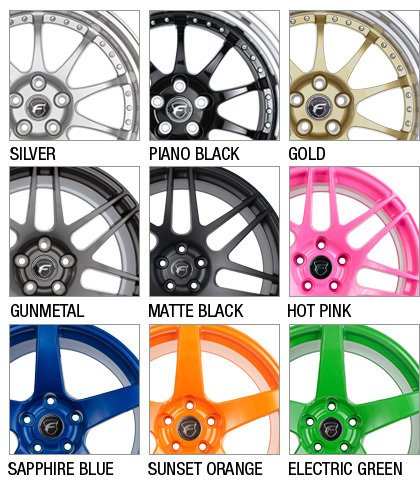 Every Forgestar wheel is custom manufactured to your own style and preference. The proper fitment of our wheels is the responsibility of the dealer or the customer who is placing the order. Please note that wheels that have been mounted with tires are no longer returnable. Please make sure fitments are correct before ordering and installing. In case of problems or returns, please contact Forgestar directly and we will attempt to resolve the problem. In some cases, Forgestar will authorized a return merchandise authorization to the factory for inspection and in order to make a determination in the validity of the claim. A RMA is required before any returned merchandise will be accepted by Forgestar. Packages shipped to Forgestar without an RMA number will be returned to the shipper.